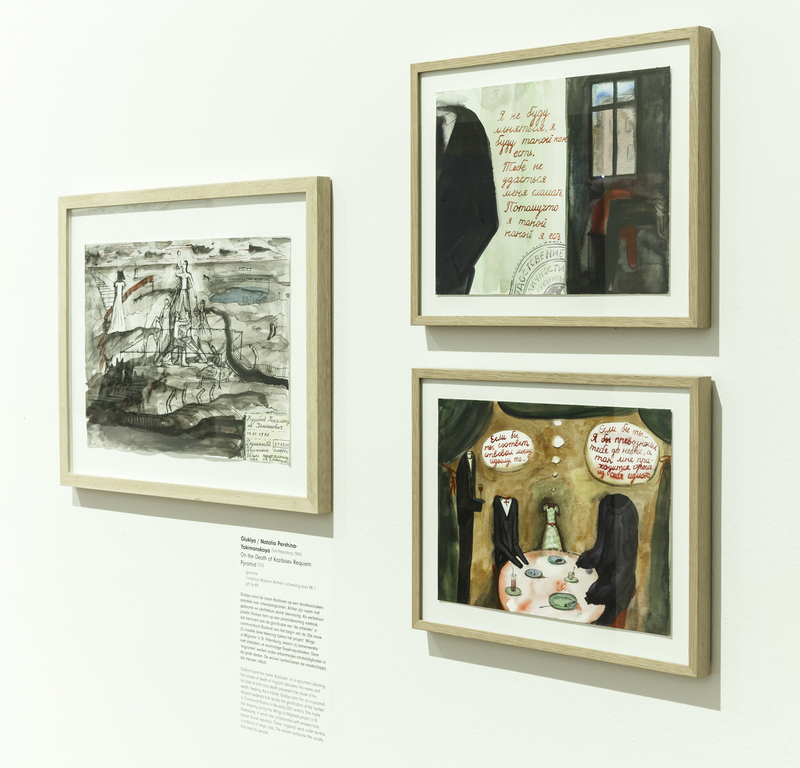 Loneliness of the intellectual (2008), titles one of the drawings featured in the permanent collection of Museum Arnhem. The pseudonym Gluklya is used by Russian-born artist Natalia Pershkina-Yakimsnskaya, who isn’t afraid to use more than paint brush and pencil. As a result of her repressed existence under Putin’s regime, she now seeks to support those who are without a voice through her activist art. She seeks to better the world through performance, video, art instillations and protests. Her smaller works - which are on display in Museum Arnhem - represent only a tiny aspect of her many facets as an artist. 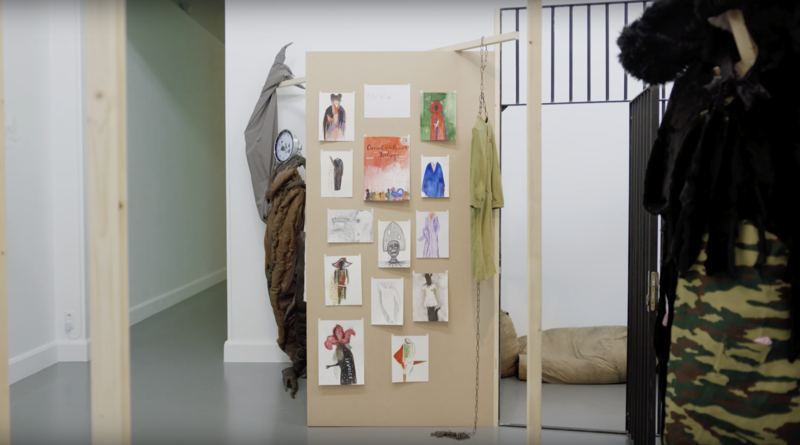 This feminist artist, with a heart as big as it is blazing, invites me to visit her studio in Amsterdam, where she lives and works alternatingly with her residence in St. Petersburg. Gluklya (depicted on the left) while protesting during ‘Carnaval of the oppressed feelings’ in Amsterdam (2017). 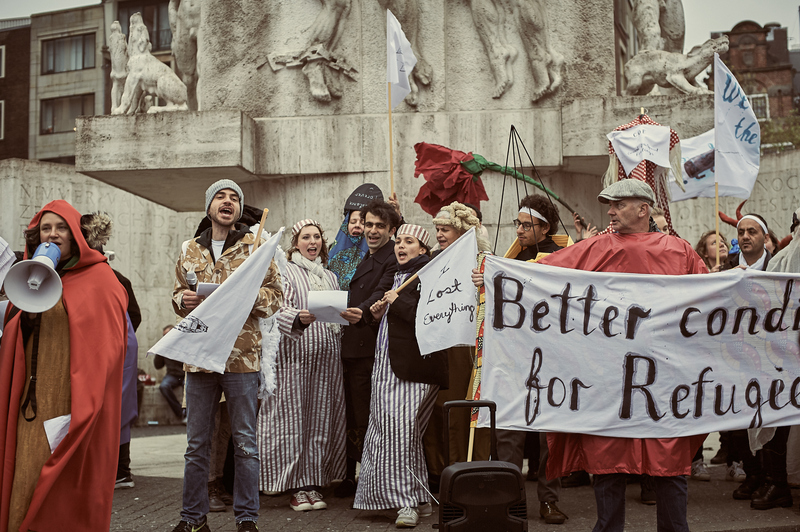 Gluklya took to the streets, accompanied by refugees being housed in the ‘Bijlmerbajes’ (an old prison in Amsterdam) all wearing clothes of their own crafting to show their vulnerability and what it is to be human. During the protest the ‘Utopian Unemployment Union’ was propagated, urging refugees and artists to stand together. 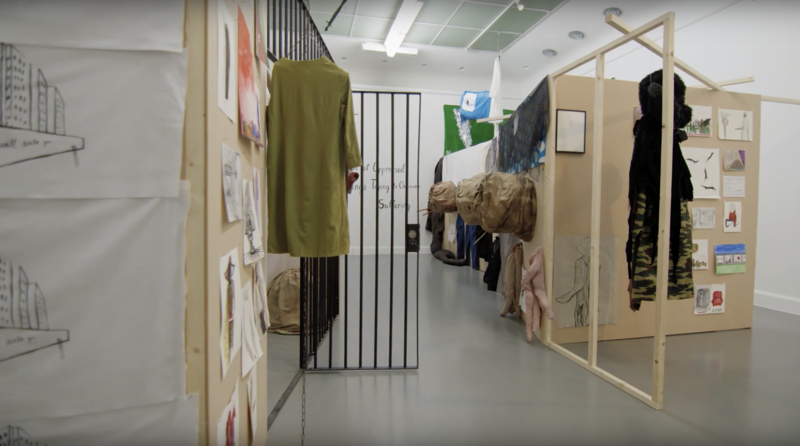 At the current exposition ‘Positions #4’ in the Van Abbemuseum, where Gluklya is engaging in a dialogue with fellow artists Naheem Mohaiemen, andi Hilal, and Allessandro Petti about activism’s place in art. The artist shows her installation in which she playfully questions the power structures in a public space. Part of the installation at Positions #4. 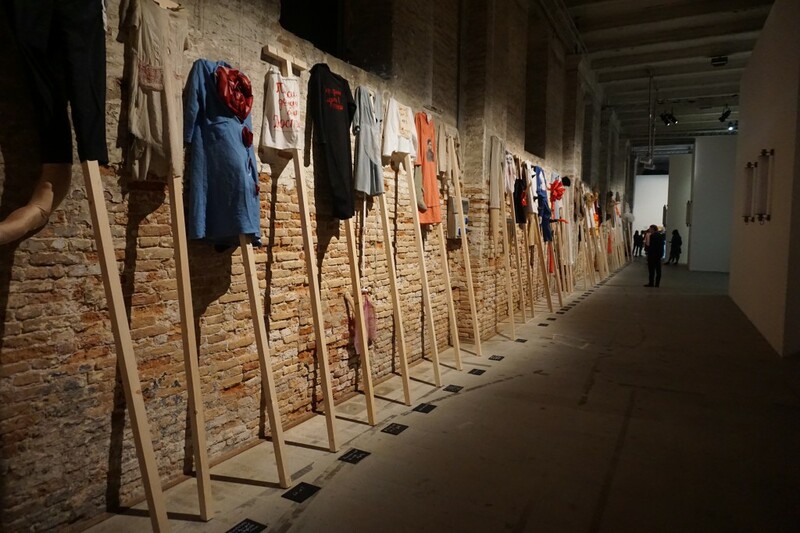 This exhibition is based on the beforementioned ‘Carnaval of the Oppressed Feelings’. Also, the birthing ground of the Utopian Unemployment Union (UUU) where Gluklya together with refugees, students, scientists and other artists fights for a peaceful society. Part of the installation at Positions #4. Gluklya combines languages from different cultures by linking sounds from the words in Dutch to an Arabic term that sounds alike. Gluklya, Loneliness of the Intellectual, 2008 (watercolor and gouche, 21 x 30cm, artwork in the top right corner). This work is divided in two parts. Left, the devil - I’m kidding, that’s my husband - and right a grieving woman. The Russian text is translated to English on the back: I will not change, I will stay as I am. I will never change myself. I will stay as I am. You will not be able to destroy me, because I am as I am. Being able to laugh at yourself is very valuable to art, and to life in general.